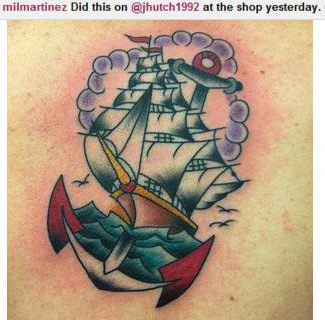 Josh's new tattoo. . Wallpaper and background images in the josh hutcherson club tagged: josh hutcherson. This josh hutcherson photo contains anime, komik, manga, and kartun. why did he get a ship with an anchor through it? If this is in fact his tattoo, what does it matter what he gets? I have several tattoos that mean something to me, only. I say more power to him. Traditional tattoo work rocks! Josh you don't need all the tattos! !